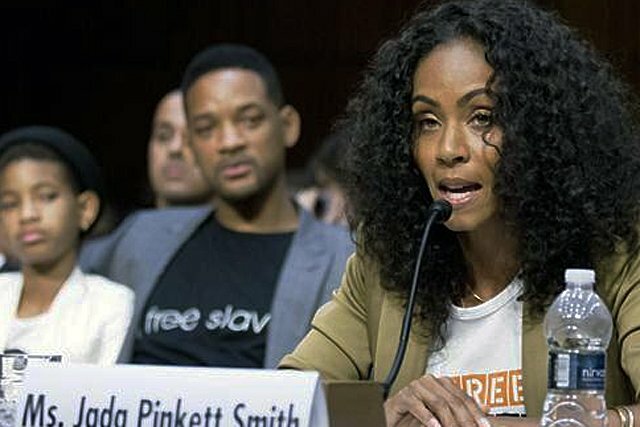 WASHINGTON, November 16, 2012 – Celebrity advocate Jada Pinkett Smith, along with her daughter, Willow, joined Senators Rob Portman (R-Ohio) and Richard Blumenthal (D-Conn) at this week’s launch of the Senate Caucus to End Human Trafficking. Survivors Minh Dang and Withelma “T” Ortiz were both present; their testimonies drove the message home that legislators must work together in order to pass effective laws against human trafficking. As I listened to their speeches, I thought of the many victims at that moment who were suffering and unaware that celebrities, survivors, and lawmakers were standing together on Capitol Hill, fighting for their rights. In the year 2000, I graduated from college with a bachelor’s degree in biology. I remember on my last day of school, I turned back for one last look at the building and thought about all that I was leaving behind. Graduating from the Richard Stockton College of New Jersey was a turning point in my life. It enabled me to walk away from a dark past and to envision a brighter future. Little did I know that another turning point had occurred in the year 2000 for those men and women, girls and boys, who shared a history similar to my own. That event was the passing of an historic law called the Trafficking Victims Protections Act (TVPA). The TVPA is a federal law which addresses human trafficking, a term I did not yet know upon graduating college. I would not hear those words for another nine years; and it was not until then that I was able to define my past. I had been trafficked at the age of fourteen by three adults, all of whom served little to no time for their crimes, due in part to the lack of trafficking laws at that time. There was no prevention or awareness for this type of crime when I was in middle school. Without any warning for such predators, I trusted a charismatic man I had met at the mall, a man who promised Hollywood fairytales if I ran away with him. Within hours of leaving home, I was sold on the streets of Atlantic City, New Jersey. I received no services following my victimization in 1992, and for nearly 20 years, I believed that what had happened to me was somehow my fault. I carried with me this secret throughout high school and college, throughout my first professional job in Philadelphia and my second in New Jersey, and throughout my many proceeding relocations across the country as I tried to rid myself of a past that seemed to haunt me. When I first learned about the TVPA years later, I swelled with gratitude at the thought of advocates and legislators fighting for my rights without my even knowing about it. I thought that I, alone, had experienced this victimization and that nobody in the world shared an interest or an understanding for my story. Since the year 2000, the TVPA has been reauthorized by Congress three times, in 2003, 2005, and 2008. In 2011, I was proud to join labor trafficking survivor, Ima Matul, in a joint testimony to Congress regarding a fourth reauthorization for the TVPA. Unfortunately, over a year later, this bill still has failed to pass. If the TVPRA fails to pass, then organizations across the country risk the loss of funding for prevention, awareness, and victim services. In addition, the United States has emerged as a world leader on this issue, annually ranking nations on their efforts to combat trafficking in persons. If the TVPRA is not authorized, what type of message does that send to other nations around the world? If the United States will not set aside partisan differences for the sake of human rights and human dignity, then why should they? I urge our legislators: Don’t let another year end without reauthorizing this legislation. One of the reasons I gained the courage to face my past and to speak out about my victimization was because the leaders of our country were already standing up and fighting for me. Failure to pass the TVPRA will risk loss of such profound support for today’s victims of human trafficking. Members of the National Survivor Network (NSN) visited with legislative leaders in Washington D.C. in September 2012 in order to advocate for the passage of the TVPRA. Since then, President Barack Obama addressed the pandemic issue of human trafficking in his speech at the Clinton Global Initiative, and he urged for the reauthorization of the TVPA. Senate Judiciary Committee Chairman Patrick Leahy also pushed for the renewal of the TVPA, as well as 45 Attorneys General who sent a formal request to House Speaker John Boehner. As a survivor, I urge legislators to stand up for those who cannot yet represent themselves and to pass SB 1301, the Trafficking Victims Protection Reauthorization Act. This bill has bipartisan support with over 50 co-sponsors and widespread support from advocates and NGOs, including the Coalition to Abolish Slavery and Trafficking (CAST) and Polaris Project. With your support, all survivors of human trafficking will have the chance at a brighter future, and we will continue to spread awareness and prevention throughout America and beyond. And once again, America will emerge as the world leader on the most important human rights issue of our time.